Harry Potter fans, rejoice. Universal Studios Hollywood rolls out the red carpet for the "Dark Arts at Hogwarts™ Castle Premiere Event," a special experience that offers fans a first look at the new light projection show at "The Wizarding World of Harry Potter" on Thursday, April 11 and Friday, April 12, 2019. This premium evening event invites guests to be among the very first to experience Dark Arts at Hogwarts Castle with exclusive, coveted after-hours access to Hogsmeade™ village, where fans can also explore the shops and experience the land's signature rides, "Harry Potter and the Forbidden Journey" and "Flight of the Hippogriff." The event's main attraction is an exclusive first-look at the all-new "Dark Arts at Hogwarts Castle" projection display that brings to light an exciting new dimension of sorcery within "The Wizarding World of Harry Potter." A mesmerizing pageantry of light, music and special effects will unleash the darkest creatures and villains from the Wizarding World, including the powerful Dark wizard Lord Voldemort. Guests will be challenged to summon their inner strength and bravery in the face of the all-consuming Dark Arts as some of the awe-inspiring moments and creatures inspired by the films come to life within the majestic light display accompanied by an atmospheric musical score created by John Williams. Additionally, guests will be treated to a premium catered feast of foods, beverages and desserts as part of this exclusive opportunity. A new wand will also debut in conjunction with the exclusive event, offering fans a chance to purchase this limited edition memorabilia and add to their wand collection. Event tickets are on sale now, which includes early entry to Universal Studios Hollywood, and are available to purchase here. Advance purchase is recommended as limited tickets are available, and event nights will sell out. 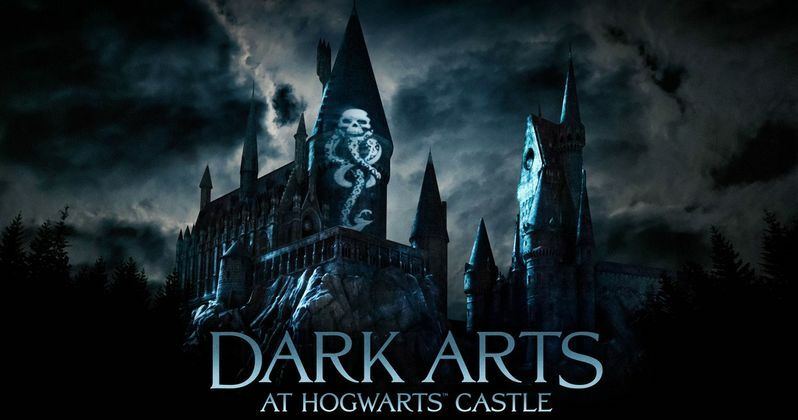 "Dark Arts at Hogwarts Castle" opens to the public on Saturday, April 13 and will continue through Sunday, April 28, 2019 at Universal Studios Hollywood. More than two decades ago, a young Harry Potter was whisked onto Platform 93Ԋ at King's Cross Station, and readers everywhere were swept along with him into a magical universe, created by J.K. Rowling. In the years since, the seven Harry Potter bestsellers have inspired eight blockbuster movies, an award-winning stage play, and, more recently, the start of the Fantastic Beasts five-film series. People of all ages have been enthralled by these extraordinary adventures, set within an expanding universe, inspired by the vision of J.K. Rowling. For today's growing worldwide fan community, and for generations to come, the Wizarding World welcomes everyone to explore more of this magical universe - past, present and future. The Wizarding World also provides fans with an instant, trusted kite-mark of quality and authenticity.